Stand Up Paddle Surfing: Surf Dogs Rule! I was a dog lover but now I've crossed over into the land of dog-weirdo... and I'm okay with it. I love my little Lilly. Depth of my dog-weirdness? 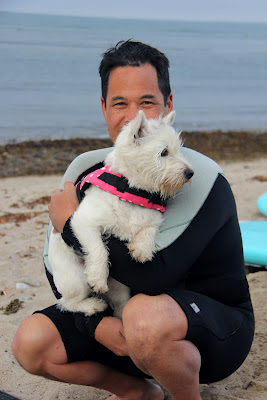 Put it this way, if I could find a little dog-kini for her I'd buy it and force the poor mutt to wear it. And a little pair of sunglasses.... Okay, I just realized what I wrote- maybe I need an intervention. You know how parents will bust out a bazillion photos of their kid playing AYSO soccer and you have to politely act like you care for the two hour long photo album session? Well, get ready- this is just one of the twenty surf dog photos I have from today's session... and you're gonna be forced to see them all! Haha!-yeah i was dat dude with the photo album when my boys were younger!-but fear not John-your supping and moto offset your Dog lovin-i will start to worry about you though if i hear you have a subscription to Dog Fancy or if you let Lilly lick your mouth as you tell her how much you wuv her! !At that point i will walk over and give you a carbon smack across the dome! Good hangin with you and su chica at the WB fest! Whatever happened to, "Thou shalt not steal. "?